Applications: Uses grip sanding discs, either with or without holes. Suits standard 125 or 150mm sanding discs. Ideal for hand sanding flat or slightly curved metal, wood or fillers. 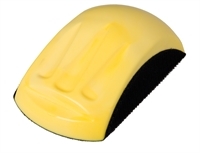 Product Notes: Easy grip hold, enabling pressure to be applied if required. The sanding discs can be rotated to spread wear and increase disc life. Diameter shown is the disc diameter the holder is suitable for. Also Available: We stock a great range of 125mm and 150mm diameter sanding grip discs that will fit these holders.